As Cher Ami tried to fly back home, the Germans saw him rising out of the brush and opened fire. For several minutes, bullets zipped through the air all around him. For a minute it looked like the little pigeon was going to fall, that he wasn't going to make it. The doomed American infantrymen were crushed, their last hope was plummeting to earth against a very heavy attack from German bullets. Somehow Cher Ami managed to spread his wings and start climbing again, higher and higher beyond the range of the enemy guns. The little bird flew 25 miles in only 25 minutes to deliver his message. The shelling stopped, and more than 200 American lives were saved...all because the little bird would never quit trying. The ability to communicate is essential to soldiers in the field. Without communications to their commanders or support units in the rear area, soldiers on the front line can't send messages about their progress, request needed supplies, or call for help when things reach their worst. During World War I, messages were sometimes transmitted by wire (telegraph of field phone), but two-way radio communications had not yet become available. Sometimes a unit was ordered to attack over a broad and often difficult terrain, making it impossible to string the wire necessary for communications. In these situations, a field commander often carried with him several carrier pigeons. Pigeons served many purposes during the war, racing through the skies with airplanes, or even being fitted with cameras to take pictures of enemy positions. But one of the most important roles they served it was as messengers. An important message could be written on a piece of paper, then that paper neatly folded and secured in a small canister attached to a pigeon's leg. Once the pigeon was released, it would try to fly to its home back behind the lines, where the message would be read and transmitted to the proper military planners. The United States Army is divided among several different specialties, the men from each specialty trained for a particular kind of work. Infantrymen are trained to fight on the ground, artillerymen are responsible for the big guns, armor refers to the men who fight in tanks, and the Air Service was the name for the group of soldiers who fought in the air during World War I. One of the oldest of these groups of soldiers was the members of the U.S. ARMY SIGNAL CORPS. Since the birth of our Nation, it was these men that were responsible for insuring that messages between all units, (including messages to other branches of service like the Navy and Marines), got through. The Army Signal Corps identifies itself by a torch with two crossed flags. These represent SIGNAL FLAGS, a common way that messages were passed using code. When the United States entered World War I in 1917, the Army Signal Corps was given 600 pigeons for the purpose of passing messages when it couldn't be done by signal flag or field phone. The pigeons were donated by bird breeders in Great Britain, then trained for their jobs by American soldiers. When a commander in the field needed to send a message, he first wrote it out on paper, trying to be both brief and yet as detailed as possible. Then he called for one of his Signal Corps officers, who would bring one of the pigeons that went with the soldiers into battle. The message would be put in the capsule on the birds leg, and then the bird would be tossed high in the air to fly home. The carrier pigeon would fly back to his home coop behind the lines. When he landed, the wires in the coop would sound a bell or buzzer, and another soldier of the Signal Corps would know a message had arrived. He would go to the coop, remove the message from the canister, and then send it by telegraph, field phone or personal messenger, to the right persons. Carrier pigeons did an important job. It was also very dangerous. If the enemy soldiers were nearby when a pigeon was released, they knew that the bird would be carrying important messages, and tried their best to shoot the pigeon down so the message couldn't be delivered. Some of these pigeons became quite famous among the infantrymen they worked for. One pigeon named "The Mocker", flew 52 missions before he was wounded. Another was named "President Wilson". He was injured in the last week of the war and it seemed impossible for him to reach his destination. Though he lost his foot, the message got through to save a large group of surrounded American infantrymen. Probably the most famous of all the carrier pigeons was one named Cher Ami, two French words meaning "Dear Friend." Cher Ami several months on the front lines during the Fall of 1918. He flew 12 important missions to deliver messages. Perhaps the most important was the message he carried on October 4, 1918. Mr. Charles Whittlesey was a lawyer in New York, but when the United States called for soldiers to help France regain its freedom, Whittlesey joined the Army and went to Europe to help. He was made the commander of a battalion of soldiers in the 77th Infantry Division, known as "The Liberty Division" because most of the men came from New York and wore a bright blue patch on their shoulders that had on it the STATUE OF LIBERTY. On October 3, 1918 Major Whittlesey and more than 500 men were trapped in a small depression on the side of the hill. Surrounded by enemy soldiers, many were killed and wounded in the first day. By the second day only a little more than 200 men were still alive or unwounded. Major Whittlesey sent out several pigeons to tell his commanders where he was, and how bad the trap was. The next afternoon he had only one pigeon left, Cher Ami. During the afternoon the American Artillery tried to send some protection by firing hundreds of big artillery rounds into the ravine where the Germans surrounded Major Whittlesey and his men. Unfortunately, the American commanders didn't know exactly where the American soldiers were, and started dropping the big shells right on top of them. It was a horrible situation that might have resulted in Major Whittlesey and all his men getting killed--by their own army. We are along the road parallel to 276.4. Our own artillery is dropping a barrage directly on us. For heaven's sake, stop it. On his last mission, Cher Ami was badly wounded. When he finally reached his coop, he could fly no longer, and the soldier that answered the sound of the bell found the little bird laying on his back, covered in blood. He had been blinded in one eye, and a bullet had hit his breastbone, making a hole the size of a quarter. From that awful hole, hanging by just a few tendons, was the almost severed leg of the brave little bird. Attached to that leg was a silver canister, with the all-important message. Once again, Cher Ami wouldn't quit until he had finished his job. Cher Ami became the hero of the 77th Infantry Division, and the medics worked long and hard to patch him up. When the French soldiers that the Americans were fighting to help learned they story of Cher Ami's bravery and determination, they gave him one of their own country's great honors. 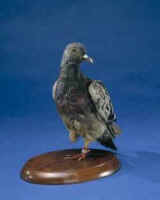 Cher Ami, the brave carrier pigeon was presented a medal called the French Croix de guerre with a palm leaf. Though the dedicated medics saved Cher Ami's life, they couldn't save his leg. The men of the Division were careful to take care of the little bird that had saved 200 of their friends, and even carved a small wooden leg for him. When Cher Ami was well enough to travel, the little one-legged hero was put on a boat to the United States. The commander of all of the United States Army, the great General John J. Pershing, personally saw Cher Ami off as he departed France. Cher Ami, how do you do! I'll not hurt you, don't you see? Come a little close to me. There, just where no feathers are. What about your poor left leg? Tell me, Cher Ami, I beg. How you won that Silver Cross. We marched so fast, so far ahead! Those watchfull guns began to puff. My! the shot was coming near! Into our own men's camp, so there!" Now don't you know that you forgot? Tell how your breast and leg were shot. I thought for sure that I should fail. Another went right through my tail. Old Poilu, there is nearly blind. Our Army's gone across the Meuse! You surely had a lucky call! And so I'm glad. I guess that's all. It's hard a-standing on one leg! Cher Ami died of his multiple war wounds on June 13, 1919--less than a year after he had completed his service to the United States Army Signal Corps. Upon his death a taxidermist preserved the small pigeon for future generations, a bird with a story that became an inspiration to millions over the years. Today, visitors to the National Museum of American History, Smithsonian Institution, Washington, D.C. can still see Cher Ami, preserved for history alongside the French Croix de Guerre with palm that was awarded to him by the French government. In the years following Cher Ami's death, there were rumors the bird had also been awarded the Distinguished Service Cross. Though there is ample documentation that General John J. Pershing did in fact, award a "silver medal" to the brave carrier pigeon, there is no record of the DSC being awarded.